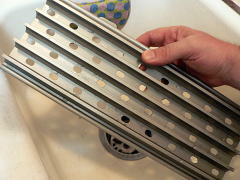 Brad at GrillGrate sent me a set of their grill toppers to try out. I’ve already tried a few different products and mostly been disappointed: The cast iron turned into a solid lump of rust, even though I was being pretty careful; the non-stick stuck hard the first time I used it and the surface peeled when I tried to clean it; the disposable aluminum ones stuck to the food even though I brushed them with bacon fat. 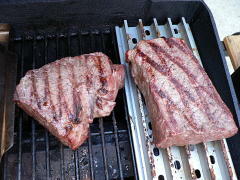 The only thing that I’ve been happy with is my stainless steel grill topper. A little bacon fat and things just slide right off, then hit it with a Brillo pad and it’s good as new. 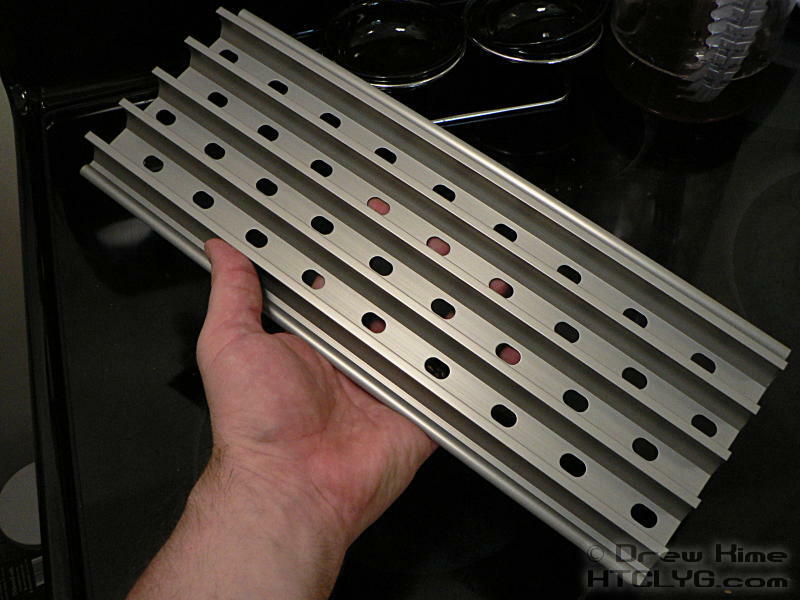 The GrillGrate is hard-anodized aluminum, so I figured it would at least be durable. 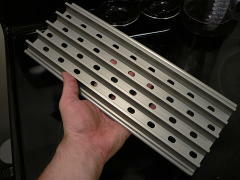 The basic kit comes with two of these 5.25″ wide x 13.75″ long sections. The raised bars are supposed to produce perfect grill marks, while the channels vaporize the drippings for more grill flavor on the meat. … to cover as much grill as you want. 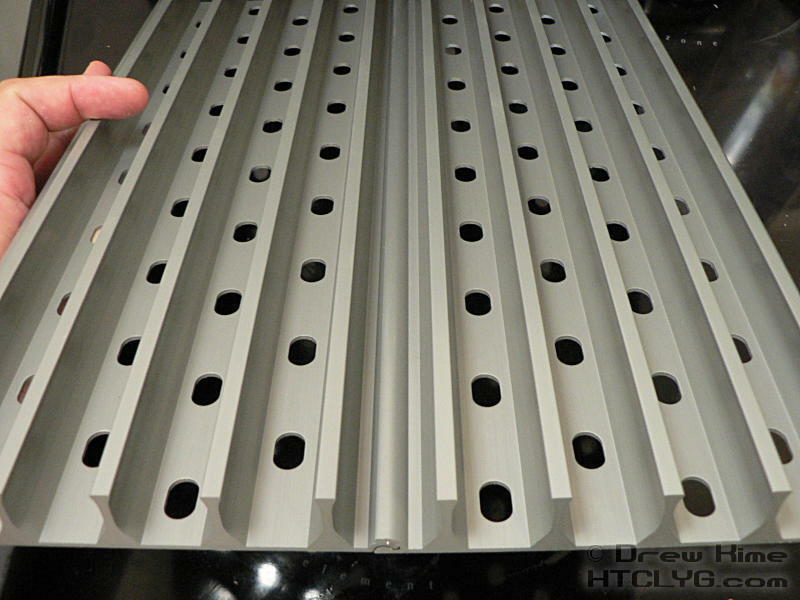 They also make sets custom-fit for the Big Green Egg and 22.5″ Weber Kettle. 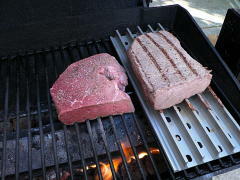 I wanted to compare the GrillGrate to the bare grill, so I took a London broil and cut it in half. Just a little salt and pepper so I could really tell if there was any difference in taste. 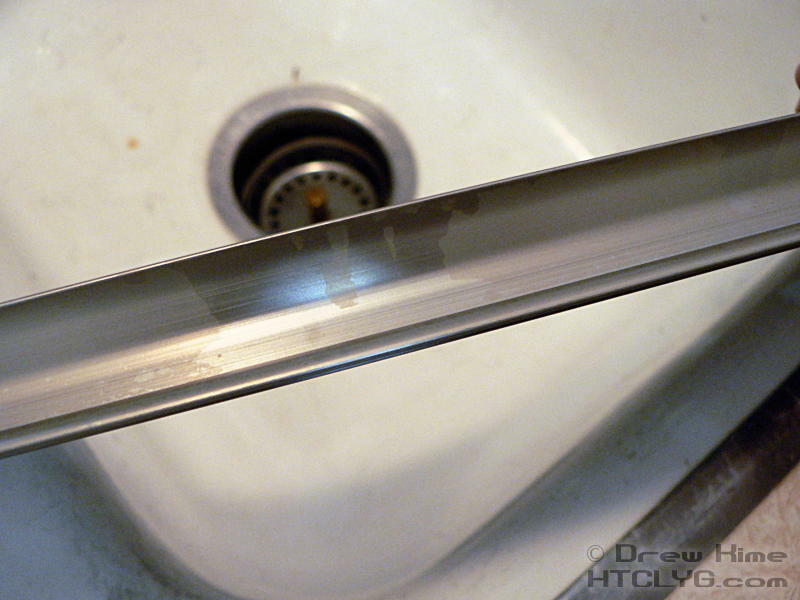 Nope, no bacon fat. 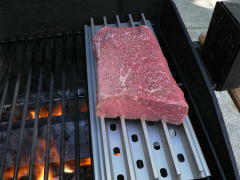 I wanted to see how non-stick the surface was. Since even bare stainless steel can be non-stick with bacon fat, that wouldn’t have been much of a test. 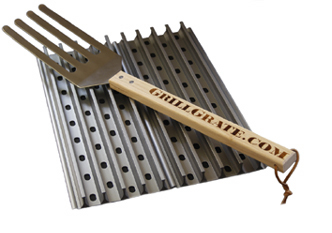 The GrillGrate also comes with a GrateTool, an over-sized fork that fits down between the bars. Very handy. Yup, perfect grill marks. So far so good. Now I added the other piece of beef to the bare grill. 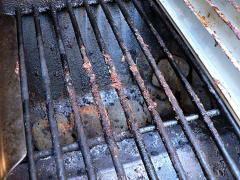 The GrillGrate had a bit of sticking going on, so I was a bit nervous. The bare grill of course had some sticking, too. 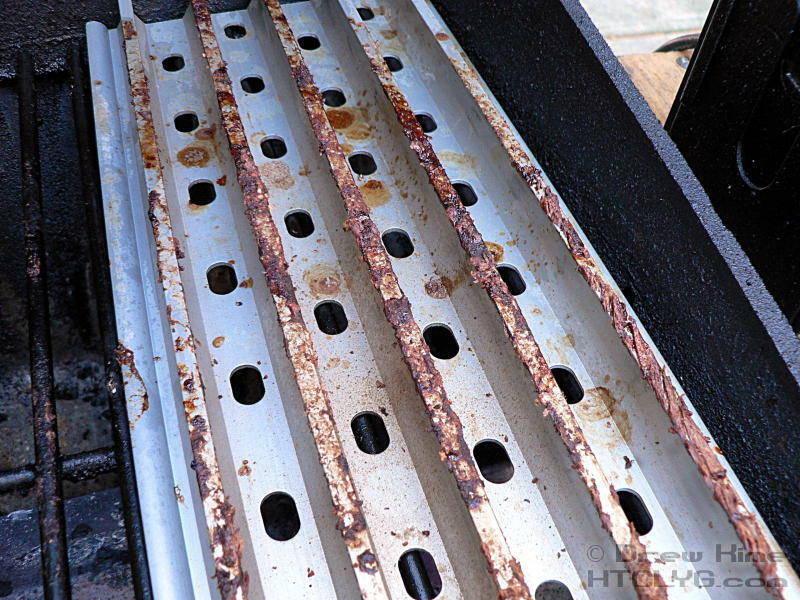 When both pieces were done, the GrillGrate piece definitely had better marks on it. 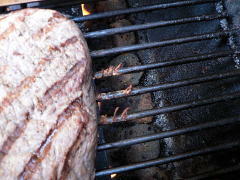 I know grill marks don’t affect the flavor all that much, but they make the meat look better. And that does matter. 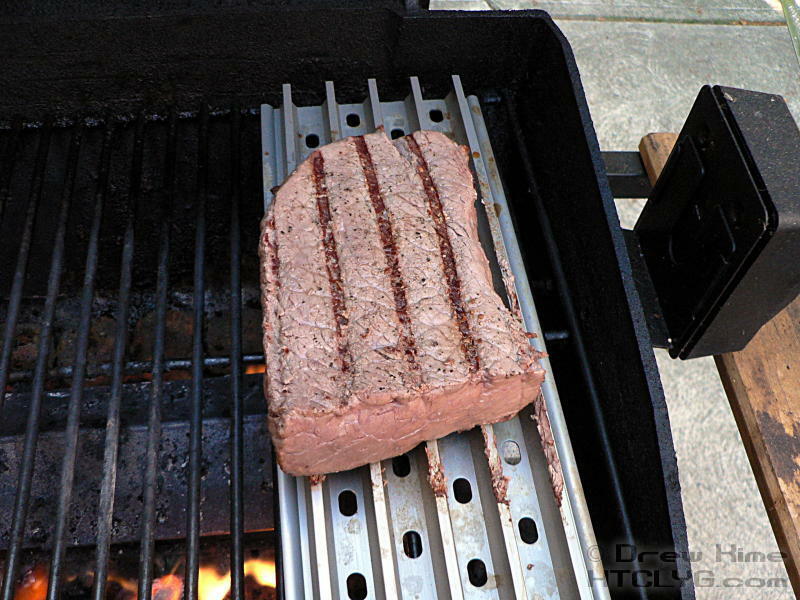 So how was the sticking compared to the bare grill? 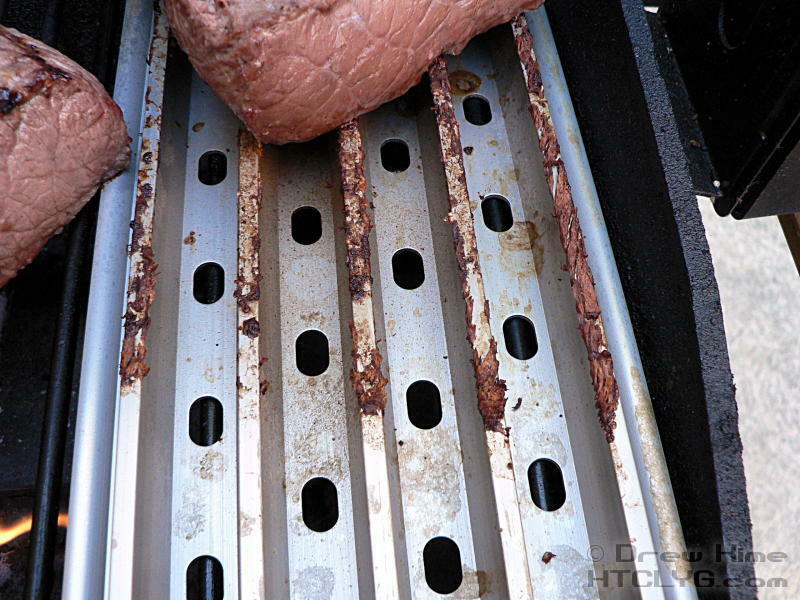 The bare grill mostly released better, but where it stuck it stuck hard, pulling off strips of meat. 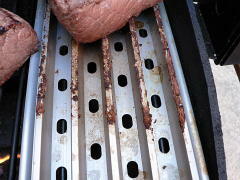 The GrillGrate stuck equally everywhere it touched, but came loose easily. 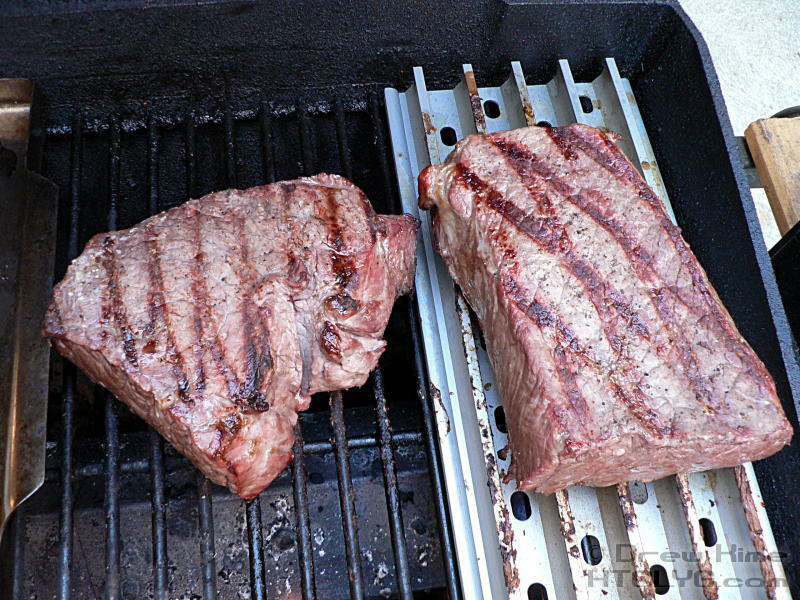 Here, after they’ve rested, you can see how much better the GrillGrate piece looks. 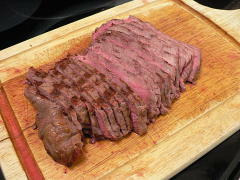 Sliced thin across the grain, nice medium rare through the middle. So how was the taste? Pretty much the same. 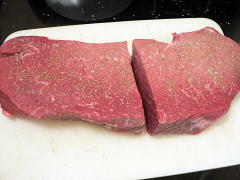 But this cut of beef was very low fat, so there wasn’t much in the way of drippings to sizzle in the channels. 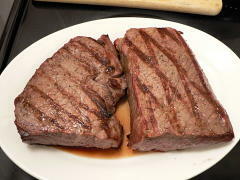 I’ll have to try again with something like a ribeye. 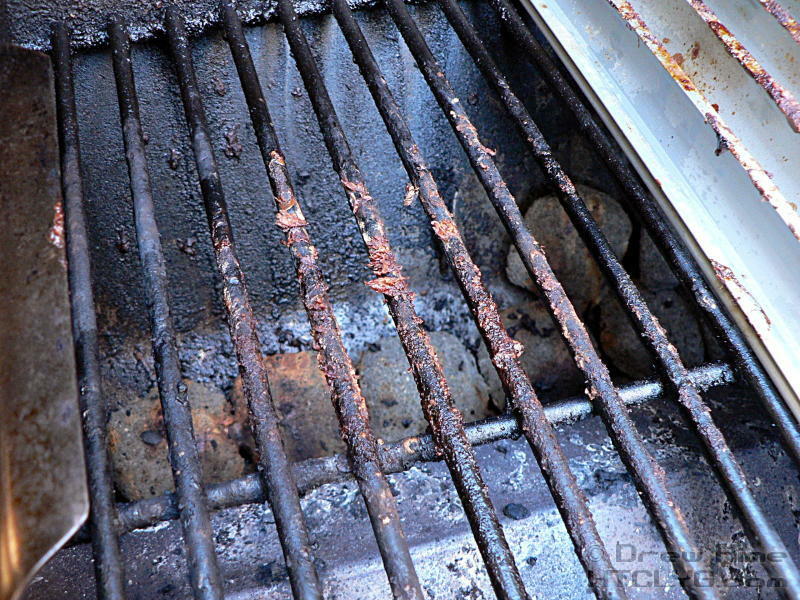 I grilled without my usual bacon fat to test under the worst conditions, so I left the grill until the next day to clean. 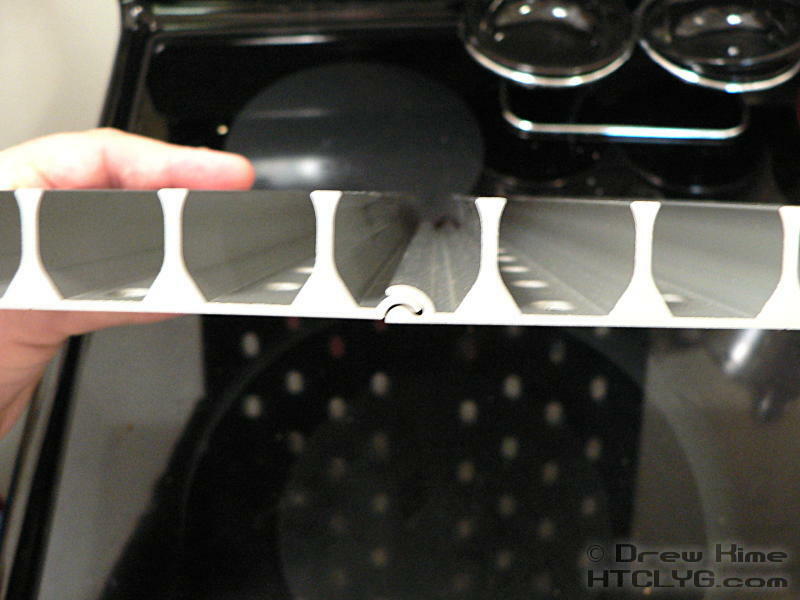 The panel fit easily in the sink. … holy crap. 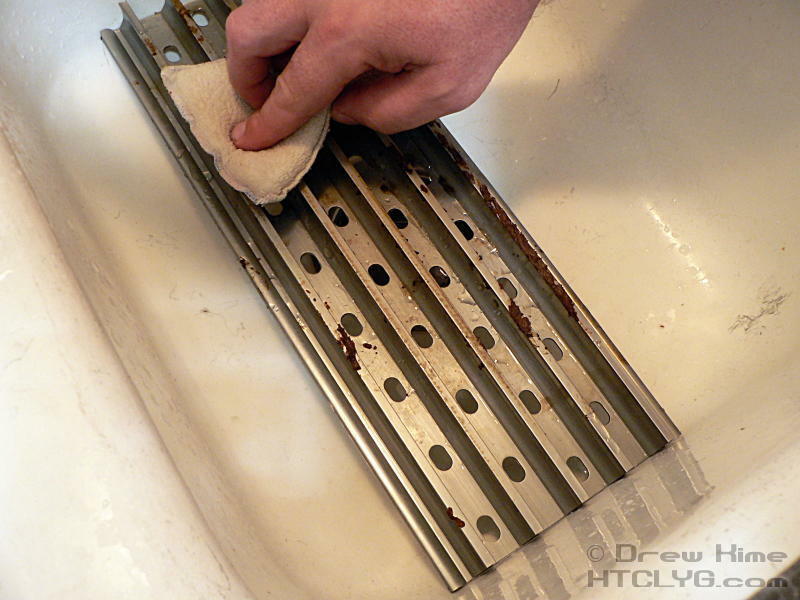 That took no scrubbing at all. I am seriously impressed with that finish. A few spots where the food was stuck on are now shinier than the rest of the piece. I don’t know if part of the coating wore off (unlikely); or if that part is now “seasoned”, with the fat from the meat filling the small imperfections in the surface. 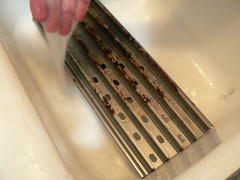 That’s how seasoning of cast iron works, so it makes sense it would happen here. 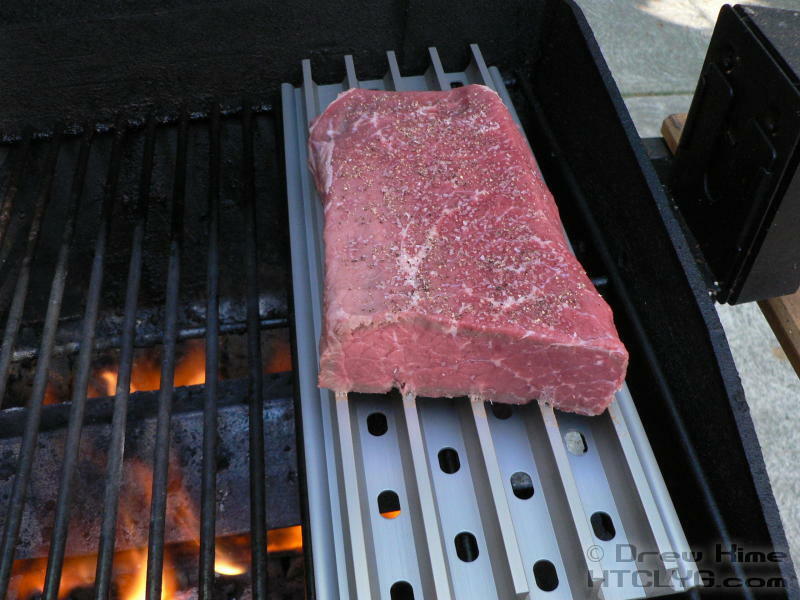 All in all, this is one of the best grill toppers I’ve tried. 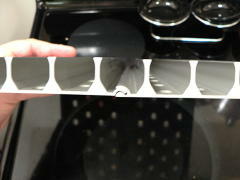 It makes the food look better, and has — for one use, anyway — the absolute best non-stick surface I’ve used. 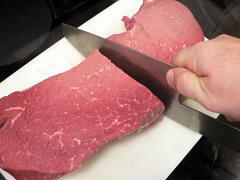 I need to do a fattier cut of meat, then use it for vegetables and fish. 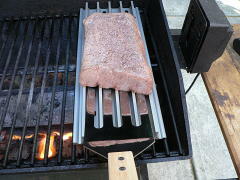 I’ll post again when I do, but from what I can see so far, the GrillGrate is a really nice accessory. Earlier this week I mentioned the braised ribs and said I did another rack later. 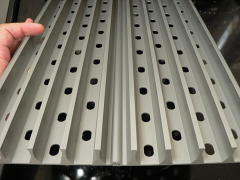 I’ve updated the ending with a picture of that other rack so you can see the difference in texture. Click here to jump right to that picture.